Shanta kumar, former chief minister of Himachal Pradesh, former parliamentarian and cabinet minister in central government is one of the oldest leader of Bhartiya janta party. Shanta kumar born on 12 September 1934 in Garhjamula of kangra district which was earlier part of Punjab. He became chief minister of Himachal Pradesh for two times and also worked as a central cabinet minister under Atal Bihari Vajpayee government. 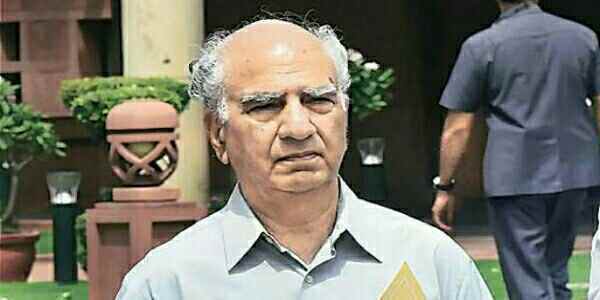 Shanta kumar is considered as one of the strong and oldest leader of Bjp, and is part of so called 'Margdarshan Mandal' of Bhartiya Janta Party. During time of emergency he was jailed in Nahan jail. Shanta Kumar is known for his fearless thinking, strong decisions and hard work. His work as a union minister is always considered as best as a politician. Shanta kumar contributed significantly in field of common food distribution department. Residence : Yamini Parisar, Tehsil Palampur District Kangra Himachal Pradesh. Shanta kumar, leader of Bhartiya Janta Party born on 12 September 1934 in Garhjamula of kangra district. His father Jagannath sharma died when he was very young. But with the help of his mother love and determination , Shanta kumar continued his study. He joined Rashtriya Swayam Sevak Sangathan when he was 17 years old. Than he started teaching job , but after 19 days he joined Shayama Prasad Mukherjee in ' Jammu-Kashmir Bachao' movement in 1953. In year 1964, he married to Amritsar born Santosh kumari Shailja. He was elected as Member of Legislative assembly in year 1972. In year 1989 he was elected as Member of parliament from Kangra seat. Shanta kumar was elected as Chief minister at the age of 43 in year 1977. He is not only good politician but a great writer. Shanta kumar born in a middle class family in Garhjamula in Kangra district. Shanta kumar's father died when he was only of age 11. His father died , family had many financial problems. But his mother stood strongly and Shanta kumar completed his education and joined active politics. Shanta kumar is a powerful Bjp leader, most of Bjp leaders are inspired with Shayama Prasad Mukherjee. But Shanta kumar have joined Mukherjee's movement. Shanta kumar was started his political career from village to Chief Minister and Member of parliament. He was elected as Panchayat president of Garhjamula , Panchayat smiti of Bhawarna and than Zila Parishad of Kangra district from year 1965-70. Shanta kumar was elected as Member of Legislative assembly in year 1972 and became chief minister of Himachal pradesh in year 1977. He was elected as chief minister again in year 1990-92, and leader of opposition in 1980-85. He was also elected for Upper house of parliament (Rajya Sabha) in year 2008 from Himachal Pradesh. Shanta kumar completed his education in very difficult situation as his father died when he was only of 11 year. He is Bachelor in Arts and LLB. He was ownered with degree of M.phil. by Garhwal University. - Shanta kumar Joined RSS when he was 17 years old. - Shanta kumar's father died when he was 11 years old. - Shanta Kumar became Panchayat president, Zila Parishad ,member of Panchayat smiti, vice-president and president of zila Parishad. - He was elected as Member of Legislative assembly in 1972 and stayed till 1985. - Shanta kumar was elected as MLA in 1990 and 1992. - He became chief minister of Himachal Pradesh in year 1977 and 1990. - Shanta Kumar worked as a Minister of consumer affairs, food and Public distribution and minister of Rural developmentin Vajpayee government. - Shanta Kumar was jailed for 19 months while emergency and written a book 'kaidi' when he was in Nahan jail.